ISELIN, NJ--(Marketwire - January 28, 2011) - His and hers iPads are offered to couples planning to be married when they book their dream wedding at the Renaissance Woodbridge Hotel in Iselin, NJ now through March 31, 2011. 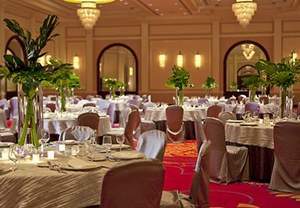 As a premier choice among wedding venues in Woodbridge, the hotel offers unique and elegant settings along with luxury amenities, stylish guest accommodations and unrivaled service to create a memorable wedding whether planning an intimate gathering or large social affair. In addition to the offer of free iPads for those planning large weddings in Woodbridge, the Renaissance offers "Rolled Back Pricing" on all weddings with packages starting as low as $99 on select Friday and Saturday 2011 dates. Couples getting engaged this Valentine's Day have a new way to save! Couples who sign a contract with the hotel to host their ceremony and/or reception, and submit a 20% non-refundable deposit, will receive his/hers iPads* with the capability of downloading any wedding application to help them plan their dream ceremony in Woodbridge, NJ. All packages include five-hour events, floor length linens, discounted overnight accommodations and a complimentary one-year anniversary stay. The Renaissance is a sophisticated choice among hotels in Edison, NJ and welcomes couples from across the area to take advantage of this exceptional offer. The hotel's magnificent offering of facilities and services includes Marriott certified wedding planners to help personalize and coordinate wedding events and details, exceptional catering services and elegant Edison banquet facilities. Among the banquet rooms is the magnificent Diamond Ballroom, with seating for up to 800 guests, and lavish accommodations and amenities for the enjoyment and comfort of the bride and groom, their families, wedding party and guests. Whether planning a bridal party luncheon or rehearsal dinner, a light buffet or elegant meal, the catering staff at the Renaissance has a variety of exciting menus to match any occasion; and the attentive services provided by hotel staff are sure to make every wedding memorable. More information regarding this unique iPad wedding package may be obtained by calling 732-510-2125 or visiting the hotel's website at http://www.marriott.com/hotels/travel/ewrwd-renaissance-woodbridge-hotel/. *All contracts must be signed by 3/31/11 and accompanied with a 20% non-refundable deposit to qualify. A minimum spend of $10,000 is required to receive one iPad or $15,000 to receive his and her iPads. The Renaissance Woodbridge Hotel is an easy choice among Edison, NJ hotels whether traveling for business or leisure, as it is conveniently located just 15 minutes from Newark Liberty International Airport and only a mile from the Metro Park rail and bus station. Offering convenient shuttle service to and from the Metro Park station and other local destinations, guests can have easy access to many popular businesses and attractions. Professional business travelers will appreciate the hotel's full-service business center, concierge services and innovative meeting space to help them maintain efficiency while traveling. Located at the crossroads of major highways, the Renaissance Woodbridge Hotel offers a convenient location for your next meeting or event.